I’d like to share with everyone the work of Nicky Grace, a local business woman who has given me encouragement and also bought some of my mitts. 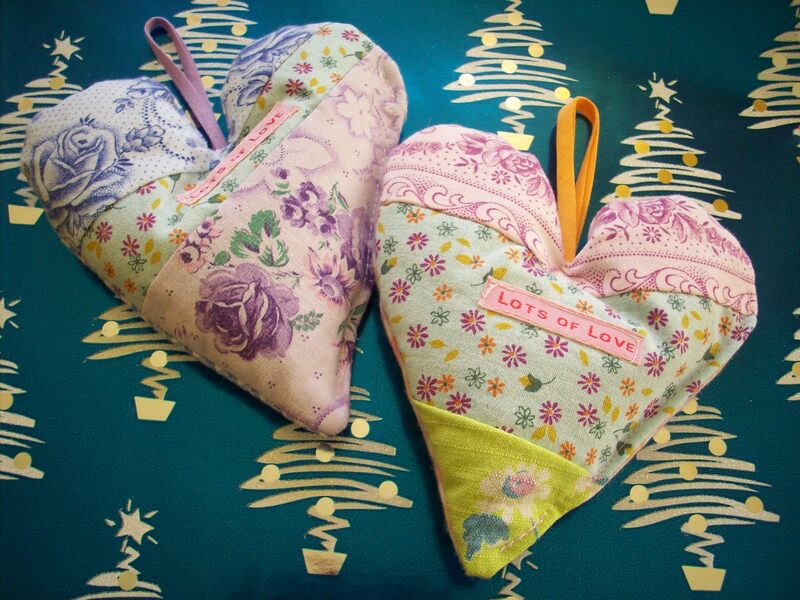 Her business is Vintage Fabric and Gorgeous Things, selling a range of goods made from vintage material, including bunting, cushions and lavender-stuffed hearts. For those keen on wool and other natural fibres, the herbal hearts are a must: lavender is reputed to deter those pesky golden clothes moths, whose larvae munch holes in our favourite jumpers. To help keep this moth (the lyrical-sounding Tineola bisselliella) at bay, I use various deterrents – lavender, of course, but also pheremone traps (which entice lusty males to a sticky end) combined with regular inspections of wardrobes and my growing yarn stash. The lavender hearts make a great “little extra something” to a main gift, so visit Nicky’s website, nickygrace.co.uk, or her online shop at etsy.com/shop/NickyGrace for some Gorgeous Things!